They may not look like much but I have big plans for these vintage beauties! At first I thought about painting them black and distressing them, maybe adding a subtle damask pattern to the tops. Then I thought about painting them a really creamy vintage aqua and painting birds on them. they have such a great shape! what would you do with these if they were yours?? And please don't tell me you would use them for firewood! I am so in love with these!!!! They have great bones! This might be a challenge! How about aqua with a glaze on top and handpainted birdsnest with eggs on the corner of the coffee table??? Maybe eggs on the end tables. Or.... black with french writing all over, or white with new hardware. That's my suggestion, for what it's worth! Me, too! I'm very excited about these and will be watching to see what you do with them. You see, I recently found two large chests in this same furniture line. I'm using them as nightstands and loving them -- but still haven't decided how to refinish them. And here are the pieces in my bedroom, as they are now. 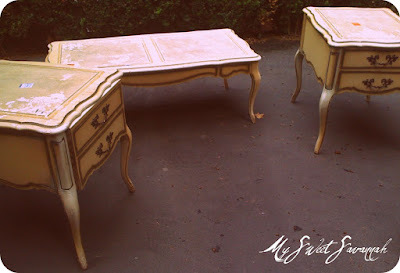 I saw a dresser almost identical to those! Were we at the same garage sale.. Anyhow, I would go for the black and distressing them. One other thought.. How do you feel about red? I love the red coffee table look, but I am not too sure how that would look on the side table. Good luck! I'd do a creamy white/distressed. They're beautiful - great find! I love them!! I would hoard them in my garage, trip over them and wish I knew what to do with them! I'm excited to see what you come up with. I know they will be beautiful! I'd go black or cream with a glaze. Benjamin Moore makes a great (somewhat pricey) Impervo tintable paint that requires one coat no primer. We just finished the kitchen cabinets. LOVE them. Much easier and worth the extra money on the B.M. pricetag. 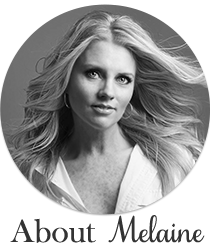 yes yes yes, your blog i lovely! What great finds! I can't wait to see what you do with them. I've been looking for a table with that style for a while now. I'd personally be painting them white, but im sure they'll look great what ever you do to them! I love them!!! I wish you were closer, I would buy them and use them in my living room. Great bones....bad paint, how about a leather and nail head top with some dark distressed paint? Can't wait to see what you with them! I love the curvy legs. These table have great lines - I would paint them a creamy white with a hint of grey and the put a brown glaze over it. I know what I would do..I would strip them down of all the paint and then I would butter creme, and a little creamy cream paint them, distress and wax..Ive done it before to that exact style and sold them 2 different times. These are almost exactly what you were looking at on the french dressing website, girl!! 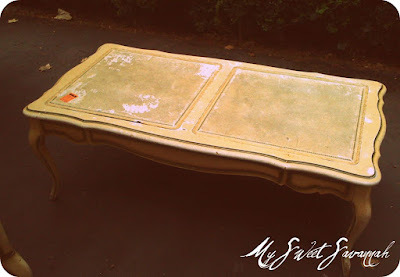 Isnt it a total blast to trip onto something like that at a yardsale? Creamy white distressed...oh so lovely! 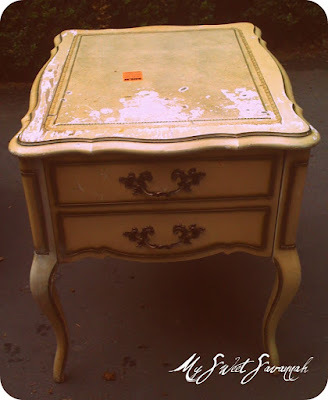 Creamy white distressed/antiqued..sounds nice, but then again I liked that idea about painting them black and with french writing all over...that sounds cute too. Good luck! Definitely not firewood! They've got great gams. I have been looking for a similar set. Black will look great, can't wait to see the results. i would paint them cottage white and distress them. they are wonderful! especially the table. oh, and your burlap runner would look great on the table. i'd kill for that coffee table!! It's too cute! Creamy white and distressed! They would be so lovely like that! My house has a black/white palatte, would love to see the pieces painted black w/ damask on top. Very chic!! I am doing a black/ white theme in my house, would love to see them black, destressed, with the damask on top, very chic!